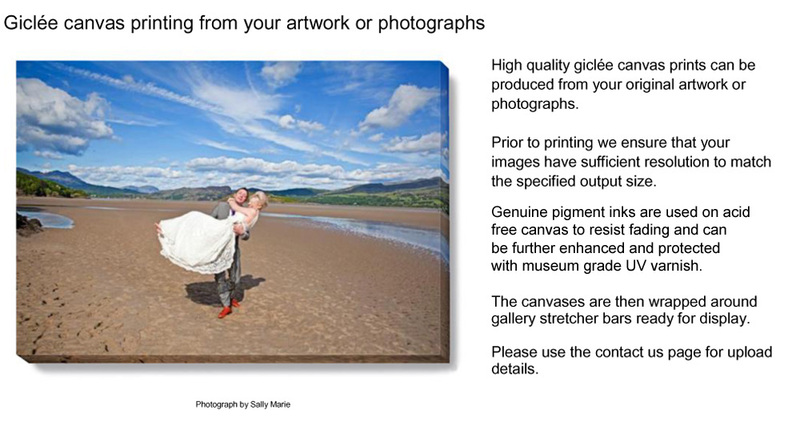 Giclee canvas printing High quality giclée canvas prints can be produced from your original artwork or photographs. Prior to printing we ensure that your images have sufficient resolution to match the specified output size. Genuine pigment inks are used on acid free canvas to resist fading and can be further enhanced and protected with museum grade UV varnish. Each canvas is then wrapped around gallery stretcher bars ready for display. Please use the contact us page for upload details.